You can re-declare a class-level variable within a method, that is–declare a local variable having the same name as a class-level variable. Within the scope of the method, the local variable will hide the class-level variable. You cannot, however, reference a class-level variable before declaring the local variable, since this is interpreted as referencing the local variable before it is defined. You also can’t reference the class-level variable in an outer scope. You store a value in a variable, or assign the value, use the = operator. The = operator is known as the simple assignment operator. When using the simple assignment operator, the value of the right operand is computed and the result is stored in the variable that appears as the left operand. The right operand is an expression containing one or more operands and operators that is evaluated to determine a resulting value. Operands within the expression can be constants, variables, properties or the results of function calls. The left side of an assignment statement can specify a variable, a property, or an indexer access. You can define variables within a method. These are known as local variables. The variables’ values can be read and written while the body of the method is executing. 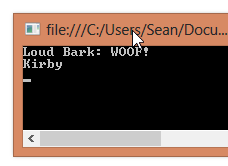 The Dog.Bark method below defines two local variables–formalName and barkPhrase. Local variables can be initialized when they are declared, or they can be set to a value later. Since C# requires definite assignment, they must be given a value before they are read. Variables must be assigned a value before they can be used. You can declare a variable without initializing it, but attempting to reference the value of the variable before you’ve given it a value will result in a compiler error. This requirement of definite assignment before use means that you are never able to reference an unassigned variable in C#. It’s considered good practice to initialize a variable when you declare it. This applies to both built-in types and custom types. When you initialize a variable, the object that it references is said to be instantiated.